placed a regimental monument under these rules. 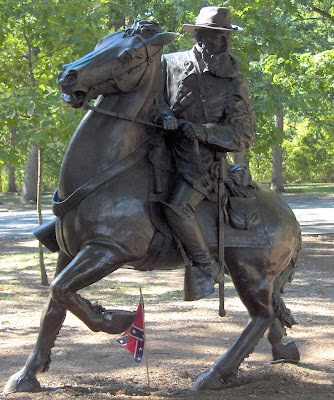 A lack of funds in the postwar South also contributed to the scarcity of early CSA monuments. When Virginia (1917) and North Carolina (1929) placed State monuments, they were located according to the above guidelines, not to serve a political or social agenda. The same holds true for the other State monuments placed along West Confederate Avenue in the 1960's and 1970's. they are located along the same fixed battle lines. Part of the reason for this is aesthetic; the early Commissioners wanted to avoid a hodgepodge of US and CSA monuments facing each other from a few feet away or intermingled; the orderly appearance of the Park today confirms the wisdom of this rule. Thank you for your very thoughtful and helpful comment. I agree that I need to be more clear about the rules of the GBMA in this project. As you know, 19th century monument placement was governed by the GBMA (I don't know if they still exist or if the NPS handles it all now). In 1887, they decided that "hereafter, regiments erecting monuments on the grounds of this Association be required to locate and place them on the line of battle" (Desjardin, 157). As you point out, this worked in favor of the Union regiments, who got to place their monuments in the most-visited areas (the Angle). But even this is political. Desjardin argues that the GBMA's chose Seminary Ridge so that the Union would get all the touristy spots, and I think he's right. But I would add that they also chose Seminary Ridge because it seemed to them, as it did to Southerners, that Pickett's Charge was a defining moment of the war. I need to be clearer on this point - I think that Southern monument builders, Northern monument builders, and regulatory committees cooperated in a project of commemoration that favored the Lost Cause narrative. I don't mean to put it all on Southerners. In the years after the war, North and South both believed in the Lost Cause to some extent because that telling made it easier to reconcile without accounting for the unfinished work of emancipation. One thing I was trying to get across was that Northern regiments did not necessarily obey the GBMA's guidelines on placement. The 72nd PA put their monument at the Angle over the objections of the GBMA and many other veterans. The Peach Orchard is littered with monuments (many of them post-18887) commemorating regiments who held that ground for, at most, a few hours. I wanted to point out the asymmetry - Confederate monuments are near their jumping-off point, while Union monuments are near their battle site. The Irish brigade didn't start out in the Wheatfield, and that wasn't where they entered the main Union line of battle, but that's where they started fighting. If the Irish brigade regiments followed the GBMA guidelines, their monuments would be placed near the Father Corby statue. Also, I still think that the Confederate memorialists had some choice in where to place monuments. When I was talking about North Carolina, I was trying to make the point that NC could have made a good case for putting their monument near Iverson's brigade on the first day's field. That would have been a legitimate "line of battle," but it wasn't the one they went with. Similarly, most of the Louisiana soldiers at the battle were in Hays' Brigade (Early's Division, Ewell's Corps) and did most of their fighting over in the Culp's Hill/Cemetery Hill area. They could have made a good case for placing the LA monument there, but they put it on practically the other end of the battlefield. I absolutely agree with you that I need to do more work on monument regulations and requirements, and I thank you for bringing this point to my attention. But I don't think I'm going to come down on the side of aesthetics - I think that monuments are placed deliberately and for political/instructive purposes. The modern battlefield may be neat and orderly, but I think that is a politically-motivated fiction. Battles are not orderly, and making this one appear so serves a larger, heroic/reconciliationist point. I don't think that this is a "modern-day agenda," but rather, a very old agenda that survives into the modern day. Thank you again for your comments, which were very helpful. I am already planning revisions and new readings. Thanks for visiting my blog!